National Gallery Victoria houses a wide range of art and creative work. General Entry is free except for select exhibition halls. National Gallery Victoria is located a few hundred meters away from Federatio Square on the other side of Yarra river. NGV is outside the free tram zone- so either get out of tram and walk or be sure to tap on and tap off your MyKi card. Once inside, we need to deposit our bags at the counter. Camera is allowed. I was greeted to this massive array of cycles. It is known as Forever Bycycles! I spent a lot of time walking around this art installation and clicking it. It is named Forever Bicycle. 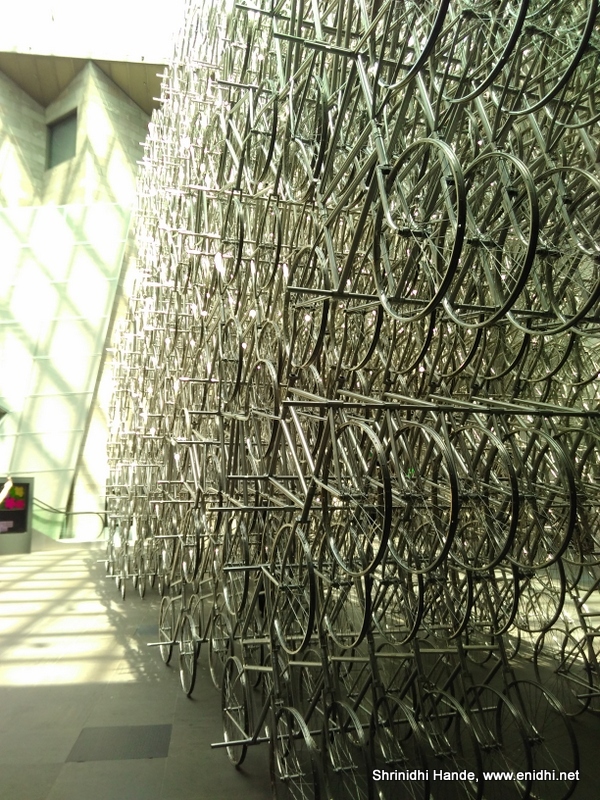 This was set up by a Chinese artist named Ai Weiwei and consists of 1500 cycle like frames. 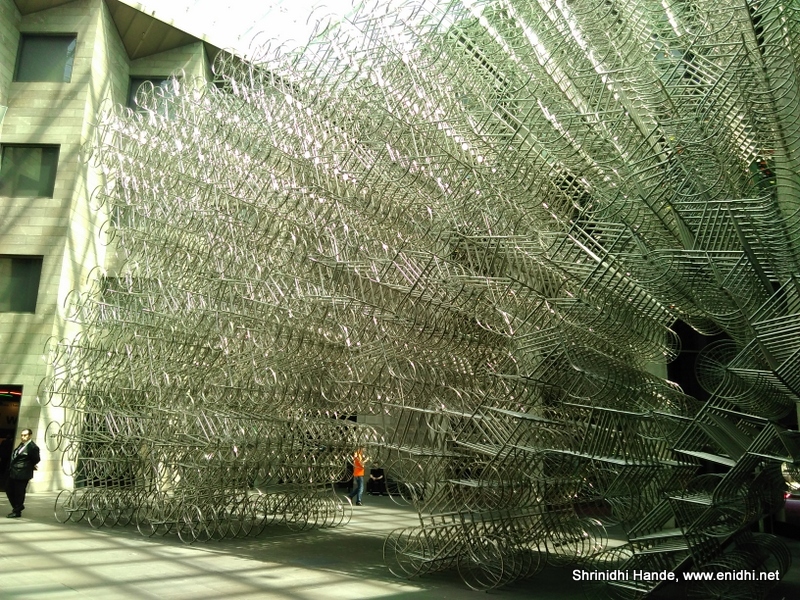 The installation is pretty massive- 9 meters heigh and takes up area similar to a badminton court. Forever Bicyle is a 1940s Chinese company that mass manufactured cycles giving Chinese people lots of mobility. 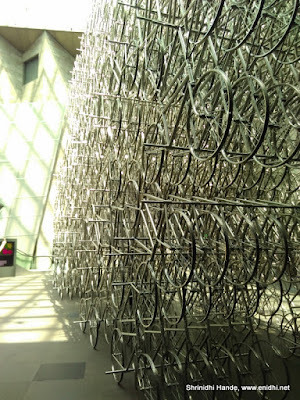 There're hundreds of other interesting art and sculptures inside the National Gallery of Victoria. Below one- a setup that constitutes lots of Procelain bowls floating in water, hitting each other as they move and making musical sound, was attention grabbing. Apparently water is heated to optimize sound comping from the porcelain and undercurrents are maintained to ensure constant motion of water. This is named Clinamen, this was setup in 2013 by french artist Celeste Boursier Mougenot and was eventually purchased by National Gallery of Victoria. NGV's official page has more details on it, if you are interested. Watch a 12 second video below. NGV has dozens of other attractions. Few select galleries are ticketed (about 20 AUD). There's an open area in the back side and recreational areas for visitors to sit and relax. When in Melbourne, do drop by at National Gallery of Victoria. Wow! This is amazing! I am stunned! This looks very interesting. I have seen something like this only once in Zurich Art Center.